Starbucks gives you everything you need to unwind - a coffee lounge for work and leisure, plenty of choices for coffee and of course free Wi-Fi! Coffee and Wi-Fi aside, we also love their interiors. Over the last couple of years, Starbucks' design strategy has been strategically oriented toward including local design styles. The thoughtful customisation of Starbucks' outlets has been achieved through a good design that includes indigenous design influences. The inclusion of local elements differentiates each Starbucks outlet from the other and makes it your go-to coffee shop. The first Starbucks to open in India is located in the heritage area of Mumbai - at Elphinstone Building, Horniman Circle. The interiors of this outlet have harmoniously blended the Ethnic Indian style with the global design identity of the brand. Here are the five things we love most about Starbucks' decor. 1. Designed by Essajees Atelier, the arches within the Horniman Circle outlet have been detailed with wooden carved panels to give it a royal touch - a perfect fit for the Starbucks interior design style, housed in a building associated with heritage. 2. The Discern Design Studio appreciates the craft and the Starbucks at Horniman Circle respects it too! This is the only Starbucks in the world which does not have a machine-made logo. The brand's logo was hand-crafted by Essajees. 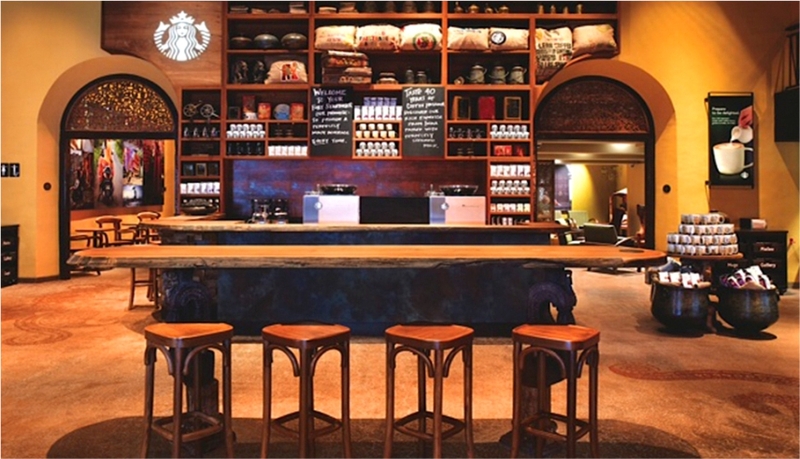 The carved arches sit in very well with the wooden log shelves, tables and bar stools. 3. 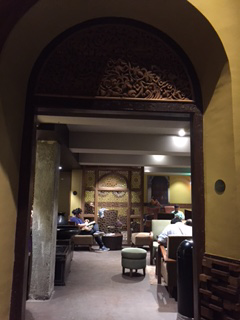 The teakwood hand-carved screen at the Starbucks, Horniman Circle outlet is bound to catch your eye. 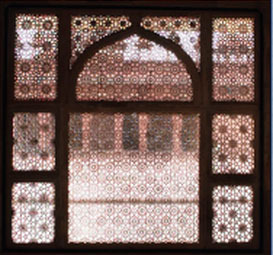 The design of this piece was inspired by the tomb of Sufi saint, Salim Chishti. 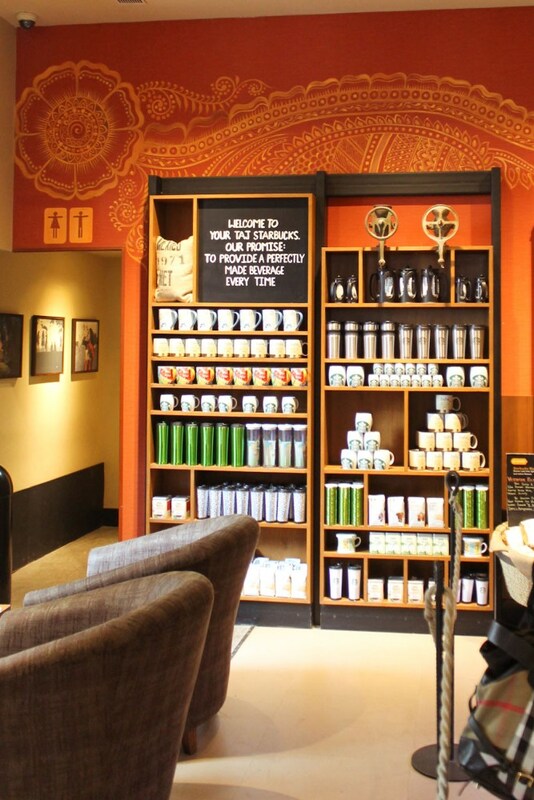 It is a signature addition to the interiors at Starbucks and highlights the brand's love for Indian craft. 4. The interiors of the Starbucks at hotel Tajmahal Palace has a stunning motif on one of the walls. Hand-painted in a traditional art form, the motif imparts an ethnic decorative touch to the wall and is bound to capture the attention of one and all. 5. Spot the brand's love for Indian heritage and culture with their choice of coffee table books. 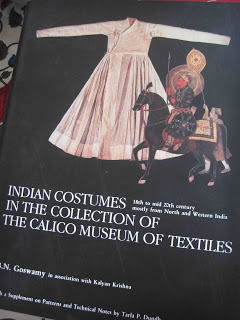 Similar to the hard-bound book in the picture below, the leather-bound books from Calico Museum of Textiles exhibited in the display cases of the Horniman Circle outlet are a signature addition to their heritage collection. 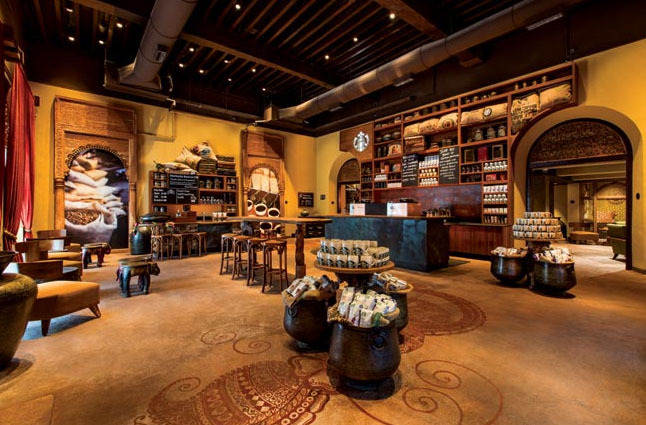 The Discern Design Studio is inspired by the interiors of Starbucks India outlets. Watch this space for our next Look! Tell us what you love most about Starbucks' decoration on Twitter and Instagram @DiscernLiving.